Everything about CMSRU was built around the students. The classroom space, curriculum design, support networks, and clinical training were all designed to maximize student success and well-being. Click here to view our Medical Education facilities, and read what our students have to say about life at CMSRU. M1-M2: Our curriculum arises from our mission. We believe that medical education should be a seamless continuum over four years, integrating knowledge of basic scientific concepts, early clinical experience and patient care, self-directed learning, teamwork, and medical and non-medical activities for the greater community’s benefit. Our students will be able to immediately apply basic scientific principles that they learn to patient care. Our collaborative and integrated approach to teaching puts biomedical scientists and clinicians together with our students, primarily in a small group setting. Students have ample time to reflect upon their experiences and enhance their understanding through self-directed inquiry. Our focus on healthcare delivery, systems engineering, outcome-driven care, and cost containment are key facets of the curriculum that will enable graduates to thrive in the ever-changing world of healthcare. Students begin seeing patients in their 5th week at CMSRU. The real-world clinical experience builds those patient-care giver relationships to keep students centered on the heart of practicing medicine. Having the opportunity to become the primary caretaker for patients during the first year has been an amazing experience. Things we learn in class are immediately transferrable to our own practice in an authentic way. Resident and physician mentors at the clinic also help demonstrate the real "art" of medicine and helps us to find our style of practice right from the beginning. – Amanda Malik. M3-M4: The third year at CMSRU is the time when students take the knowledge and skills they have acquired during the first two years of medical school and apply them to various specialties. Students rotate in Adult Primary Care (Family Medicine and Internal Medicine), Pediatrics, Neurology, Obstetrics and Gynecology, Surgery and Psychiatry. Opportunities to care for patients arise in the hospital, faculty offices and clinics. The students care for patients longitudinally as part of a clinical team with faculty and residents. 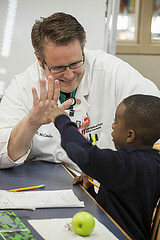 As the year progresses, students begin to take on more responsibility with patient care. It is a year where students experience tremendous growth in their knowledge base and clinical skills. 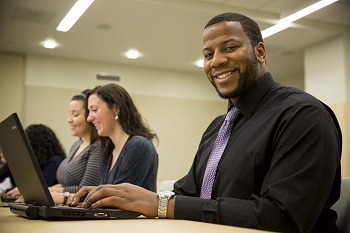 The fourth year at CMSRU gives our students great flexibility in allowing them to pursue future career paths. Each student has four required rotations to complete – Chronic Care, Critical Care, Emergency Medicine, and a Sub-Internship. These four courses provide students with the tools and skills to succeed during their residencies with regards to patient care. The rest of their fourth year is dedicated to 20 weeks of elective time. Students are allowed to do this time at Cooper or any LCME accredited institution in the United States or Canada. This time can be used to either confirm their career choice in a particular field of medicine or provide a unique experience that they may never see again. This journey is not taken alone by the students, but is guided by advisors who have their best interests at heart. 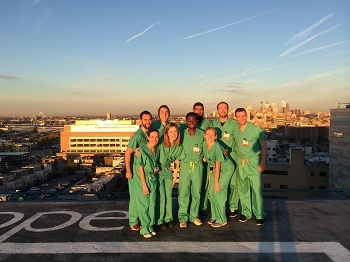 As part of the Ambulatory Clerkship, CMSRU students develop their patient care skills in the community setting through self-designed service learning experiences. 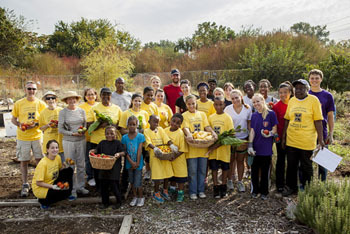 Throughout the year, all students are engaged in community based service programs that directly serve Camden residents. 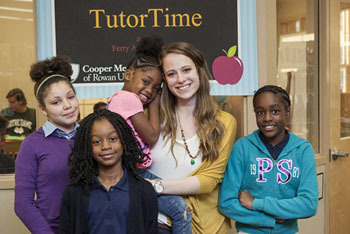 As an integral part of their curricular training, they build proficiency in critical skills, such as cross language communication, education and teaching skills, cultural competency, relationship building, collaboration, and active listening – all of which are used heavily in providing effective patient care. 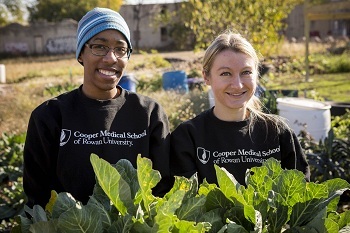 While being immersed in the Camden environment, CMSRU students also gain direct insight to the social determinants that can adversely affect health and the health maintenance of vulnerable populations. This experiential learning, supported by didactic sessions, reflection assignments, and group discussion, enables students to contextualize the social challenges of the patients they meet while working in the student clinic or hospital floors and practices. They are trained to better unravel and understand patient complexities and help develop customized treatment plans that pay close attention and are sensitive to these qualities. With emphasis within the current healthcare delivery system being increasingly placed on cost and quality of care, CMSRU students are being actively trained to address these priorities by assessing health needs comprehensively and providing patient-centered care that is appropriate and impactful. Service Learning at CMSRU is more than just a community service requirement, it’s a culture that encourages a sense of responsibility and indebtedness in all of our students. We have an incredibly supportive administration that allows us to create programs that best fit the skills of our students with the needs of our Camden community. From special tutoring programs and after-school mentorship, to weekend science enrichment programs and tree-planting, CMSRU has no limits to the way we give back. After almost two years at CMSRU, I full understand why “Service Learning” is an integrated course in our curriculum. I’ve learned so much while working with young children, high school dropouts, and parents from very different backgrounds than myself. From these interactions I’ve gained a lot of perspective that helps me better understand and treat my patients in the clinic. I also learned a lot about leadership and earning the respect of your peers through your own display of commitment and selflessness. The way my classmates give their time and energy at Service Learning is indicative of their character, and I’ve learned a lot about what kind of qualities I respect now in my fellow classmates, and what kind of qualities I would like to see in my future co-workers.